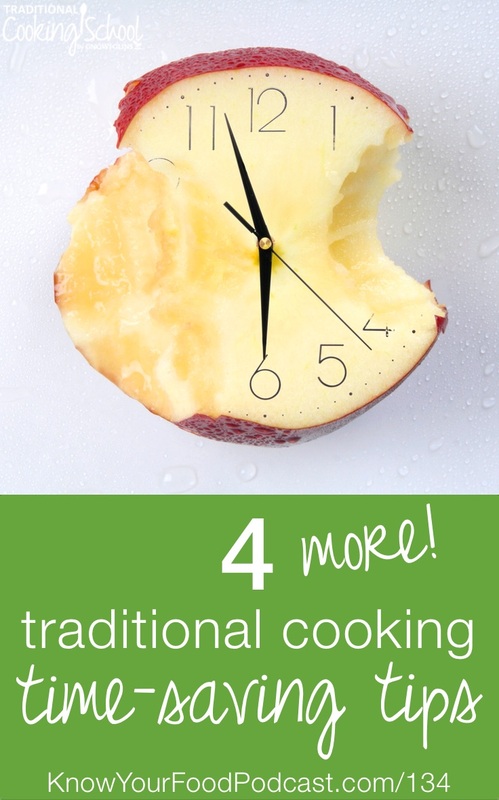 Of course I want to hear your answers… and in this podcast, I'm sharing four more of my own time-saving traditional cooking tips. Listen to the podcast for the full version of this! Tip #1: Clean up as you go. Keep up with clean up. It is just so much easier to face the kitchen when it is not backed up with dirty dishes. Serve dinner with the prep dishes already done. A friend has a family chore schedule with four dishwashing chores — breakfast, lunch and dinner as you'd expect, but also an afternoon dishwashing for all the dinner prep dishes. Tip #2: Keep a sink full of soapy water. I love this! When preparing a meal, everything dirty goes in there (except for knives) for immediate, easy washing or loading in the dishwasher. This tip came from member Peggy a long time ago when I was overwhelmed with a messy kitchen. Tip #3: Go to bed with a clean kitchen. This may be a hard one if you're used to saying, “I'll deal with that in the morning.” Yet if your kitchen can be spanking clean before bed, that's the best. Who wants to wake up to an already full day with a mess to clean up in the kitchen? Not me! My whole day goes better and more efficiently if I start out with a clean kitchen. Tip #4: Work in 15 minute increments. Got a mess in the kitchen? Things got a little chaotic? Set a timer for fifteen minutes and see what you can accomplish! This really works for me and it is so motivating that sometimes I even look forward to it. The rest of your cooking/prepping will go much smoother with the little confidence boost that a quick cleanup offers. Also, when you set that timer and devote yourself to the cleanup, you're very efficient because of the focus and intentionality. Get the kids involved and it will go even faster! and have one good meal with you !!! Thank you for the tip that you have a timer set at 15 minutes and you can accomplish a lot in that amount of time. What a good idea. That way I know, since I am really old, I can sit down for a break in 15 minutes. Donna — You are too cute. 🙂 I hope this tip has helped you get lots done! I love the 15 minute timer idea!! All the other ideas I still need some work on. 🙂 We do leave some dishes at night, because that is our family time. But, I have a teen who does those in the morning. So, that works for us for now. Kristie — You do what works and that’s the important part, right? 🙂 Thanks for sharing! I really like this episode I also have developed the habit of clean as I go and it makes a world of difference . There’s something so satisfying to putting the final pot on the stove or pan in the oven or whatever and looking around and there’s no more dishes or utensils and you’re just waiting for that food to finish! Embracing minimalism in the kitchen helps such a lot! Having the minimal amount of dishes, utensils and appliances that you need means a lot less washing up, dusting, sorting, etc.